Robert De Niro & John Travolta Will Face-Off in Mark Steven Johnson's 'KILLING SEASON'! Millennium Films have announced that production will begin January 16th 2012 for Killing Season [previously Shrapnel], starring Robert De Niro & John Travolta. Mark Steven Johnson directs from a script by Evan Daugherty [Snow White and the Huntsman]. The movie, set in the Appalachian Mountains focuses on a U.S. veteran [De Niro] who has retreated to a remote cabin in the woods. When a rare visitor, a European tourist [Travolta], appears on the scene, the two men strike up an unlikely friendship. The visitor is a former Serbian soldier bent on revenge. What follows is a tense, action packed battle across some of America's most forbidding landscape that proves the old adage: the purest form of war is one-on-one. The movie has been compared to The Edge directed by Lee Tamahori back in 1997, which had Anthony Hopkins & Alec Baldwin facing off in the woods. 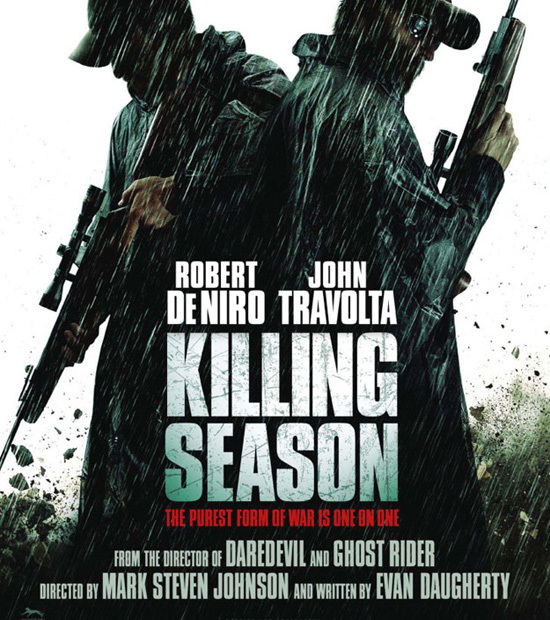 I'm reading: Robert De Niro & John Travolta Will Face-Off in Mark Steven Johnson's 'KILLING SEASON'!Tweet this!